Richmond Park Plumbers Ltd specialise in all types of heating and gas services. We will help with anything, from simple radiator fitting to full underfloor heating and a whole lot more. We are never far away in an emergency. If your boiler or central heating isn't working, or you want to take advantage of our servicing, our experienced gas and heating engineers are here to help. Alternatively, if you're looking to upgrade we can help with that too! We are Richmond based plumbers, who are experienced in providing a comprehensive plumbing service and always strive to maintain a high standard of customer satisfaction. Looking for a reliable plumber, have a problem with your boiler or central heating? Richmond Park Plumbers are only a phone call away. We have a team of highly experienced plumbers covering the Richmond, Chiswick, Wimbledon, Hammersmith, Twickenham, Middlesex and South West London areas. 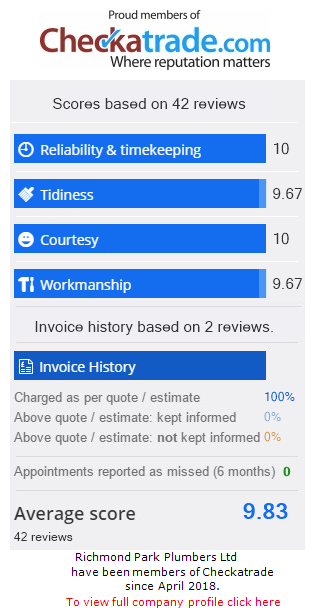 Over many years we have built up a reputation for a fast, efficient, friendly and competitive plumbing service, be it boiler repairs, boiler service, boiler installation, general central heating services or bathroom installations. Need assistance urgently? Our emergency plumbing services are available any time you need us - 24/7. Give us a call NOW. Our plumbers can also assist you with new bathroom installations and general plumbing services. We can arrange finance for bathroom and boiler installations - up to £25K finance available. Take advantage of the Boiler Plus Scheme*. Reduce your monthly energy bills with the latest range of highly efficient boilers. *Launched in April 2018, this Government scheme’s aim is to reduce domestic carbon emissions and encourage energy efficiency in your home. Contact us for further details. Call Richmond Park Plumbers for plumbing, central heating and drainage services in Richmond, Middlesex & surrounding areas of Surrey and London. "I own a number of properties in the south west area and always have used Richmond Park Plumbers. Service is always friendly and extremely professional. Highly recommended." "Brilliant job Tim arrived on time, did an excellent job, very polite and professional, explained everything to me. Highly recommended." "Very impressed with the service, problem was diagnosed and fixed straight away"